It's an expansion of a similar recall last month from Tris Pharma, which manufactured the medication for CVS, Walmart and Family Dollar stores. 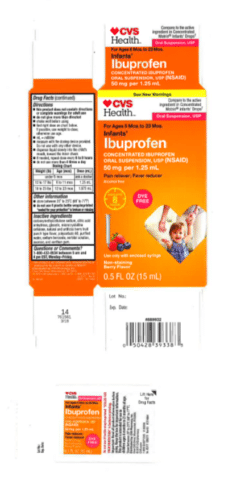 WASHINGTON — A pharmaceutical company voluntarily recalled more bottles of infant ibuprofen this week over concerns they have an elevated concentration of the medicine. It’s an expansion of a similar recall in December from Tris Pharma, which manufactured the medication for CVS, Walmart and Family Dollar stores. Some of the lots, the company said, “have been found to contain Ibuprofen as high as 10 percent above the specified limit.” Safety for infants, they said, generally isn’t a concern until concentrations exceed 700 percent of the recommended dose. Read more about the recall on Tris Pharma’s website.